The Castle Country House offers you the experience and style to stay in one of 4 spacious bedrooms with decor, furniture and beds that are all original restored antiques but with the comfort of the 21st century living. We bring the elegance and style of an Edwardian craftsmanship for you to enjoy with a pleasant and comfortable nights sleep. This original bedroom is presented as either a single or a double bedroom situated to the side of the house over looking the gardens. 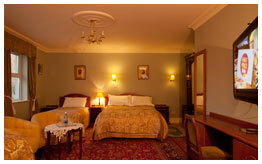 The bedroom is in the oldest part of the house and is tastefully furnished with original Edwardian furniture. An inspiring large bedroom with a double bed and 2 single beds. Tastefully decorated from the Edwardian period. 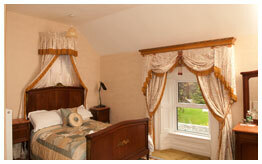 The bedroom is situated to the side of the house over looking the garden. This large room sits to the back of the house overlooking the court yard and a 1720,s artisons stone cottage with immediate views of the 13th Castle tower House. 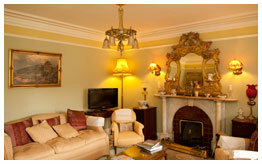 The bed room can accommodate a large family where extra beds are required. A modren bedroom with period furniture. 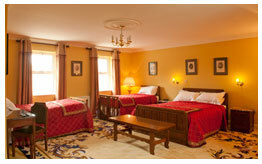 The accommodation as with the other bedrooms boasts of ample space with en-suit bathroom. 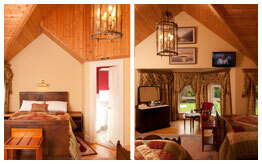 The bedroom looks outward to the castle and a 18th century cottage. A beautiful rich featured sitting room with original decor is a balance of 1850 to 1914 design and has been used as a family sitting room for over 140 years. With a large single bay over looking the front garden the sitting room has serviced generations of family events and festivals. The Castle Silver service is renowned for bespoke dining services. 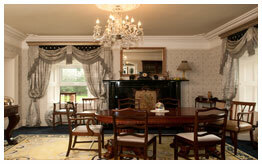 We have 2 beautiful dining areas. Offers exquisite and private full silver service a A La Carte dining for up to 12 people which is set in an original furnished Edwardian setting. Please contact us for menu and prices. 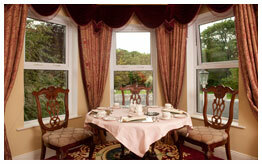 This dining area which can accommodate up to 60 sitting guests and overlooks the gardens. Ideal for small functions, weddings and conference dining.